The Snowmobile Capital of the World, Top #1 and #2 Snowmobile Trails in the West- these are just a few accolades West Yellowstone, Montana has earned among the vast snowmobiling community. For nearly fifteen years, West Yellowstone, Montana has remained the West's most popular snowmobile destination. Its proximity to Yellowstone Park makes it an optimal destination location for snowmobile enthusiasts around the world. As its west entrance, West Yellowstone, Montana is the most popular gateway to Yellowstone National Park. As a town, West Yellowstone's local community offers a rich bevy of amenities and activities, from shopping to dining and more. As the premiere destination for snowmobile adventures, West Yellowstone's impeccably groomed trails, dependable wintry weather, and hundreds of miles of open play areas make it the perfect location for all snowmobile-related activities. When you're ready to explore outside of Yellowstone Park, the trails in and around West Yellowstone are perfect for non-guided snowmobile rides and off-trail play. Our trails are easy to navigate, and the snowmobile trails maps are provided by the West Yellowstone Chamber of Commerce are available at most West Yellowstone businesses. Each intersection on the map has a number, and out on the trail there is a corresponding number. Our staff at the Brandin' Iron Inn is the most experienced in the area, and can match your needs and wishes with one of the preferred vendors we use. Let us book the trip for you, or use one of our convenient winter packages. From our lodging facility you can ride your snowmobile on the street (legally) just minutes to the nearest trailhead that connects with over 300 miles of 15+ foot wide groomed snowmobile trails. The town celebrates its favorite weather with special events like ice fishing tournaments, dog sled races, and Nordic Ski races. Its annual Snowmobile Expo and Powersports Show showcases snowmobile gear vendors, new snowmobile models, featured exhibitions, and much more. West Yellowstone's extensive snowmobile trail system features hundreds of miles of seamless snowmobile terrain and includes Idaho's snowmobile trails. Visitors are free to snowmobile over the many vistas overlooking Montana, Idaho, Wyoming, and Yellowstone National Park. 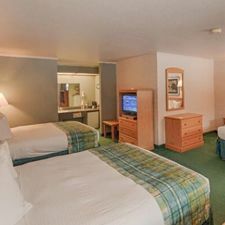 Ask about our special room and rental offers! This favored loop trail takes you up to almost 10,000', and is one of the gateway trails to the deep and steep powder snowmobile play areas near West Yellowstone. This is a loop trail, or use it to interconnect with the Two Top, or Idaho snowmobile trails. Perhaps the most popular snowmobile trail in the area, this snowmobile loop trail offers some of the best opportunities for snowmobile fun. Don't miss a glimpse of the "ghost trees" as you set on top of this 9,000-foot mountain! These trees are so impacted with snow that they resemble "white ghosts" to the visitors passing by. When on the Two Top Mountain Trail, you are literally straddling the continental Divide, which is also the border of Montana and Idaho. This trail provides great access to those wishing to play off trail, or drop off the mountain to one of Idaho's lunch stops only accessible by snowmobile. 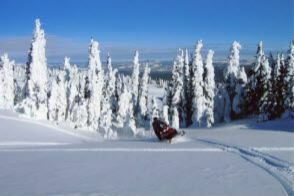 This snowmobile trail heads north of West Yellowstone, offering a variety of scenery, vistas and powder play. At the end of the groomed trail, about 18 miles from West Yellowstone, the trail continues on ungroomed into and through the largest play area in the region. Some of the deepest snow, and steepest mountains can assure any level of snowmobiler a full day of "high marking" and "powder carving". This is one of the longest loop trails in the area and directly parallels Yellowstone National Park. You can spend most of a day on this trail or playing in the powder along the way. This trail can interconnects with the Idaho trail system, so you can return over the Two Top trail, after stopping in Idaho for lunch. West Yellowstone's trails are easy to navigate, and maps are available at most West Yellowstone businesses. Snowmobile tour and Snowcoach reservations are highly recommended, especially if you plan to visit during the busy Christmas or New Year's Day holidays. First, decide whether you intend to snowmobile inside or outside Yellowstone National Park. Next, determine if you'd prefer to bring your own snowmobile or rent one  your rental company or the Brandin' Iron Inn staff can offer discount packages or recommendations if you chose to rent. As a premiere snowmobiling destination, West Yellowstone offers more snowmobile rentals, models, and brands than any other region in the country. Instead of hauling your own snowmobile with you and having to adjust it to the high elevation and deep powder, consider renting a snowmobile from any of West Yellowstone's fine vendors. You can bring your own snowmobile clothing and helmet or rent from a vendor. Ask any of the Brandin' Iron staff or locals for their preferred snowmobile rental vendors that will meet your riding abilities and style. When bringing your own snowmobile, the Brandin' Iron Inn has plenty of large vehicle parking available, along with plugins for your block heater. Let Us Help Book Your West Yellowstone Snowmobile Tour! The Brandin' Iron Inn staff is a proud provider of snowmobile tour booking services and consultations; our experienced staff is happy to help you book your next snowmobile tour. Let us know about your specific tour needs and preferences, and we'll connect you with any of our partner vendors for a quality snowmobiling vacation. Ask about our convenient winter packages! Inquire today, or give us a call directly at 1 (800) 217-4613.